Herein, we present a rare case of a young lady, presenting with multiple subcutaneous nodules in her left shoulder, initially misdiagnosed as an Ewing sarcoma (ES) on FNAC smears, elsewhere. A 28-year-old lady presented with multiple, subcutaneous supraclavicular swellings, associated with intermittent pain of one and half-year duration. She did not have any other significant medical, surgical, or family history. On clinical examination, there were multiple, subcutaneous discrete-to-confluent, firm, nonmobile, slightly tender nodular lesions in her left shoulder, fixed to the underlying structures. She underwent radiologic imaging, followed by FNAC at another hospital. The smears were submitted to us for review. Subsequently, she underwent a core needle biopsy from the various nodules. Magnetic resonance imaging (MRI) revealed multiple, discrete, and confluent rounded, enhancing nodular lesions within the skin and subcutaneous fat in her left supraclavicular region, located posteriorly over the trapezius muscles and superficial fascia. The lesions were hypointense on T1 and hyperintense on T2-weighted images. Post-contrast, these lesions showed moderate inhomogeneous enhancement with smooth margins [Figure 1]. Fluorodeoxyglucose (FDG) F18 positron emission tomography (PET) computed tomography (CT) scan showed low-grade metabolic uptake in the left supraclavicular subcutaneous nodules (SUV max 2.25). Smears were moderately cellular, comprising cohesive clusters and acinar-rosetting arrangement of cells with round-to-oval nuclei and scant cytoplasm, along with cells containing relatively darker nuclei and few scattered lymphocytes, against a background of red blood cells (RBCs). Interspersed were stromal matrix cores that appeared as spherical hyaline "droplets/bodies." Diagnosis of a skin adnexal tumor was offered [Figure 1]. Microscopic sections revealed multiple, sharply defined basophilic tumor nodules in the dermis, extending into the subcutis and unattached to the overlying epidermis, comprising round-to-oval cells arranged in acinar, cord-like, trabecular, and diffuse arrangements. Focal lumen formations were noted. There were two types of cells, including small dark basaloid cells with relatively dense nuclear chromatin towards the periphery (myoepithelial cells) and larger cells with pale nuclei closer towards the lumens. There was no significant pleomorphism or mitotic figures or areas of tumor necrosis. Interspersed were numerous hyaline "droplets/pink bodies" that were periodic acid Schiff (PAS) positive, as well as diastase resistant, along with scattered lymphocytes [Figure 2]. By immunohistochemistry, the relatively pale cells towards the lumens displayed strong positivity for CK7. Significant number of tumor cells, comprising myoepithelial cells were S100 protein positive. Epithelial membrane antigen (EMA) highlighted the lumens of the ductal structures. Tumor cells were negative for carcinoembryogenic antigen (CEA) (monoclonal col1) and displayed weak C-KIT/CD117 immunostaining. Ki67/MIB1 highlighted 5-10% tumor nuclei in the most proliferating area [Figure 3]. Diagnosis of multiple eccrine spiradenomas was offered, and the patient was recommended excision. FNAC is useful in the diagnosis and triage of skin adnexal tumors, considering these tumors invariably present as superficial lesions, which is accessible for FNAC. ,,,,, Rarely, cases of multiple eccrine spiradenomas have been reported. The present case is the first report of multiple eccrine spiradenomas, identified as an "adnexal tumor" on FNAC smears. 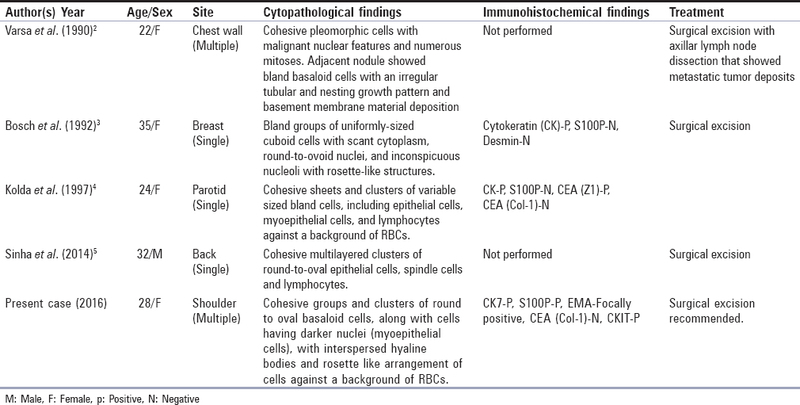 Nearly 5 cases describing cytopathological features of an eccrine spiradenoma have been reported [Table 1]. ,,, Most of these have been reported in adult female patients, presenting with painful nodules, similar to the present case. On cytologic examination, presence of small hyaline bodies reminiscent of stromal matrix and basement membrane material within cohesive clusters of banal, round to oval cells, including relatively darker, myoepithelial cells and scattered lymphocytes constituted as diagnostic clues for a skin adnexal tumor, over ES, even though both tumors display round cells with rosette formations. ,,, In addition, ES comprises tumor cells with coarse nuclear chromatin. While diagnosis of an adnexal tumor can be made on FNAC smears, its subcategorization is difficult, in view of overlapping morphological features. Basaloid cells, "ghost" epithelial cells admixed with pink fibrillary material, and calcium deposits are identified in a pilomatrixoma. Adenoid cystic carcinoma constitutes another differential diagnosis. 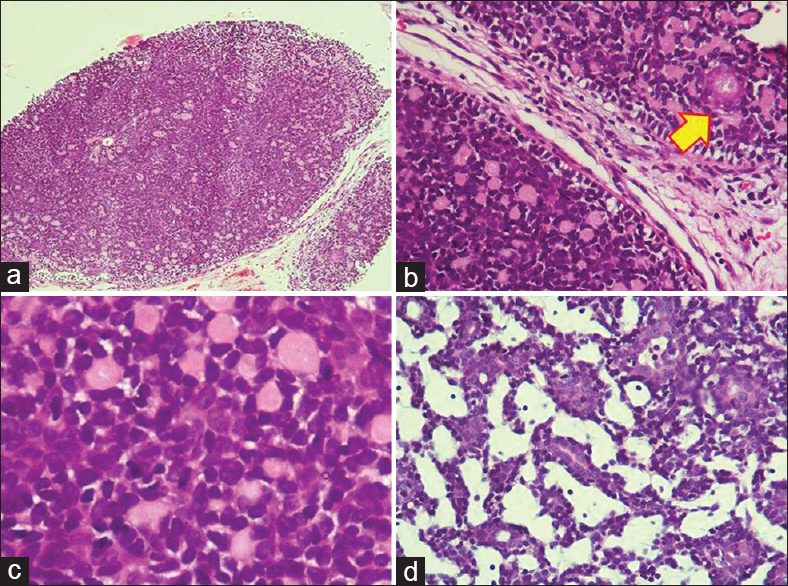 Presence of epithelial cells, along with myoepithelial cells and scattered lymphocytes, are observed in an eccrine spiradenoma, in contrast to monomorphic cells that are more associated with an adenoid cystic carcinoma. These features are also useful in differentiating an eccrine spiradenoma from a dermal cylindroma. Diagnosis of an adnexal tumor in the present case prompted a biopsy from various nodules that the confirmed diagnosis of eccrine spiradenomas. Histopathologically, cylindromas display "jigsaw puzzle" arrangement of tumor cells, whereas eccrine spiradenomas occur as multiple dermal and subcutaneous lobules. Moreover, multiple eccrine spiradenomas are relatively more common than cylindromas that rarely occur in the form of multiple lesions in scalp location ("turban" tumors). Possibility of a malignant eccrine spiradenoma in this case was less likely because the biopsy cores were accessed from all the representative lesions and none of the tumor nodules on histopathological examination revealed features of malignancy. Moreover, all the tumor nodules displayed a similar low FDG-PET avidity. To summarize, careful attention toward clinicoradiological and cytopathologic features is useful in diagnosing rare adnexal tumors, such as multiple eccrine spiradenoma, using FNAC. Correct diagnosis in the present case helped in obviating a radical surgery and adjuvant chemotherapy that constitutes the treatment for ES. Despite recommendation for a surgical resection, unfortunately, our patient was lost to follow-up. We would like to thank Dr. Pranjali Guppta, MD, Department of Surgical Pathology, Tata Memorial Hospital, Mumbai for helping in procuring some of the clinical details of this case. Daskalopoulou D, Galanopoulou A, Statiropoulou P, Papapetrou S, Pandazis I, Markidou S. Cytologically interesting cases of primary skin tumors and tumor-like conditions identified by fine-needle aspiration biopsy. Diagn Cytopathol 1998;19:17-28. Varsa EW, Jordon SW. Fine needle aspiration cytology of malignant spiradenoma arising in congenital eccrine spiradenoma. Acta Cytol 1990;34:275-7. Bosch MM, Boon ME. Fine-needle cytology of an eccrine spiradenoma of the breast: Diagnosis made by a holistic approach. Diagn Cytopathol 1992;8:366-8. Kolda TF, Ardaman TD, Schwartz MR. Eccrine spiradenoma mimicking adenoid cystic carcinoma on fine needle aspiration. A case report. Acta Cytol 1997;41:852-8. Yoshida A, Sato T, Sugawara Y, Matsuta M, Akasaka T. Two cases of multiple eccrine spiradenoma with linear or localized formation. J Dermatol 2004;31:564-8. 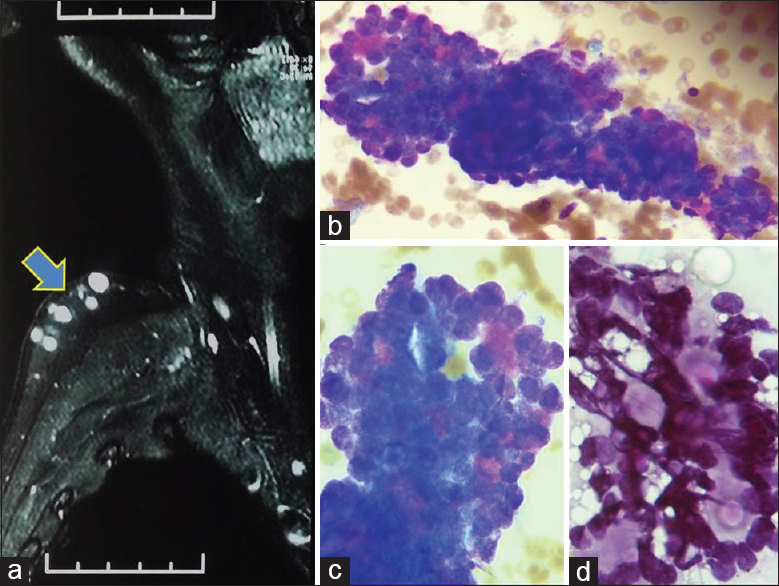 Barui GN, Karmakar R, Sinha A, Bhattacharya A. Pilomatrixoma: Misdiagnosed as a round cell tumor of soft tissue on fine needle aspiration cytology. J Cytol 2009;26:125-6. Missall TA, Burkemper NM, Jensen SL, Hurley MY. Immunohistochemical differentiation of four benign eccrine tumors. J Cutan Pathol 2009;36:190-6. Nishida H, Daa T, Kashima K, Arakane M, Urabe S, Yoshikawa Y, et al. KIT (CD117) Expression in Benign and Malignant Sweat Gland Tumors. Am J Dermatopathol 2015;37:898-905. 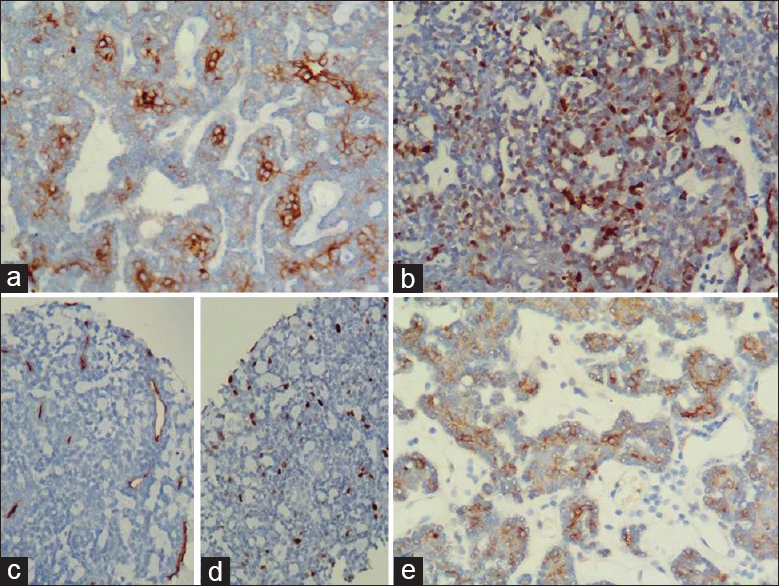 Sellheyer K. Spiradenoma and cylindroma originate from the hair follicle bulge and not from the eccrine sweat gland: An immunohistochemical study with CD200 and other stem cell markers. J Cutan Pathol 2015;42:90-101.